Sergio Emilio Monleón (left) and Emily Sarlatte have already found success with La Marcha. 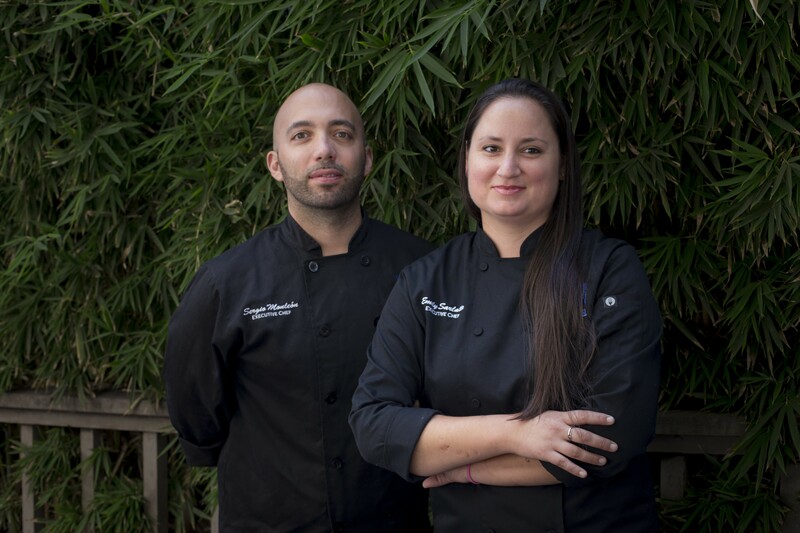 Sergio Emilio Monleón and Emily Sarlatte, chefs and owners of Berkeley’s popular La Marcha Tapas Bar, plan to open a new wine shop that would cater to millennials, seasoned wine connoisseurs, and everyone in between. San Pablo Ave., on the same block as La Marcha, and will carry a curated selection of wines from around the world. It should open in late summer or early fall. “The concept is kind of like a neighborhood, approachable wine shop for the younger generation that wants to come and explore and learn about wine,” Monleón said. While La Marcha specializes in Spanish-style tapas and paella feasts, The Mile Limit will not be limited to Spanish wine. The owners do, however, plan to feature some Spanish influences, though they’re still figuring out what exactly that will look like. Monleón and Sarlatte have spent significant time in Spain. The goal is to highlight wines from parts of the world that are underrepresented in the wine industry and Bay Area retail spaces. One such place is Portugal, which Monleón says produces specific bottles he hopes to carry. They will also carry rare varietals that may be on the verge of extinction. (Varietals are typically wines made from a single type of grape.) Because most people ask for familiar wines — their Rosés, Chardonnays, Cabs, and Merlots — the smaller varietals that are lesser known and less carried in restaurants sometimes stop being produced. The owners are excited to introduce these to the public — and perhaps save them from extinction. “We’re looking for unique finds that you can’t find in the larger chains or supermarkets,” Monleón said. The other focus is on California-made wine. The Mile Limit plans to carry ones from wineries run by immigrants, “who came over from Mexico and worked their way up, and now run their own wineries,” Monleón said. Their goal is to educate people about wine and engage both connoisseurs and folks who are new to the wine world. Monleón is not sure yet if the new shop will include food, too. Berkeley just a few years after the new campus was completed. (The Mile Limit space is located just over a mile from campus). And though national Prohibition ended in 1933, the one-mile dry zone law in Berkeley wasn’t repealed until about 100 years after it was implemented, in the 1970s.